Phra Chao Fang Monument Moo 3,Wieng The king along with his wife, whose name was. "Queen Sam Piew" the daughter of governor of Lan Xang. (Vientiane) She’s very beautiful spreading everywhere and she has three skin colors. In the morning there will be white like a cotton. In the afternoon there will be a red like a Gord ball. And in the evening the body of her skin as pink as the Lotus flower. while he ruled the city Fang. Fang City remains a city of Myanmar. King Fang , he had the idea to reestablish freedom to Fang City. Gather the troops ,Food and militant with Myanmar. By refusing to pay tribute and mutiny of Myanmar. The regime has learned that the city Fang would win their joints. The army's defeat. The Burmese king 's name was. "Pawa Sudtho Rhammaraha" as the Grand Marshal led the army to attack Fang City in the year 2176 BC to 955 tickets God Fang led troops staunch defense of the city. The Burmese king cannot urban Assault Fang city so The Burmese king as a new battle plan changed by the military around the city. And camped on the north side of the city, Fang. Then ordered the soldiers archer fire (artillery) into the city, Causing unrest Town. Military casualties and public panic down a lot. King Fang and Queen, thought that the cause of this war. Cause that caused them both to salvage the idea of independence. People have suffered and this action was unsuccessful. Both of them decided to devote his life to protect the city from starvation King Fang and Queen were killed By jumping wells of help Fang’s people. So The Burmese king appreciate the heroism of King and Queen Fang. Who gave his life to protect his people. He has ordered his troops not to attack on the town And the army returned to the city was occupied by Burmese Ava Fang whatsoever. 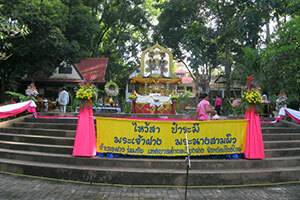 Travel Located on Health Park is at Wat Phra Bath Udom, Wiang, Chiang Mai.